On December 3rd, I had the privilege of attending the swearing in ceremony for our new Clerk of Court Meredith Edwards and her staff, and later that of Sheriff Terry Johnson and the men and women who serve in our Sheriff's Office. Both of these offices are critical to my efforts to make our courts more efficient and our county safer, and I am blessed to have these public servants working with me toward these goals. Although I have been working diligently since the May primary in preparation of becoming District Attorney, I will formally take office January 1, 2019. Because it is a holiday and courts are closed, I will take my official oath privately that day in order to promptly assume my Constitutional duties. However, on January 2nd at 8:30 a.m. in the Superior Courtroom in the J.B. Allen, Jr. Courthouse, I will join my team in taking our oaths together before heading to court to do the business of Alamance County. This ceremony is open to the public, and you are all welcome to be a part of this special occasion. 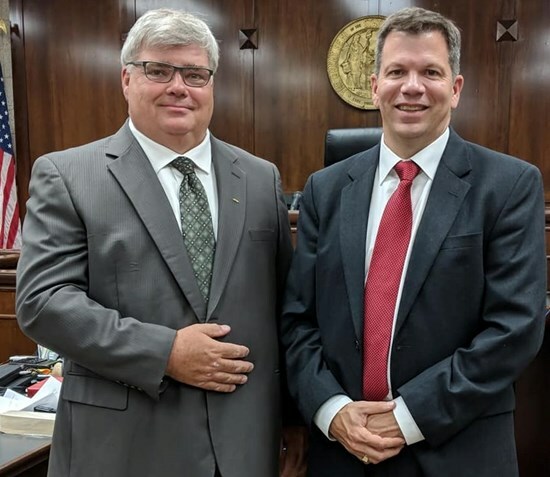 I am excited to announce that my good friend Alex Bass was recently sworn in as an Assistant District Attorney for Alamance County. When I won the Republican primary in May, he was the first person I approached about taking a position as my Chief Assistant District Attorney. Even though I do not take office until January, the opportunity arose for him to start early. Alex brings a wealth of experience to the D.A. 's Office. He is a graduate of Davidson College and Wake Forest School of Law. He has 26 years experience as a prosecutor, most recently serving as Chief Assistant District Attorney in Buncombe County for the last 3 and a half years. He will be a great resource for our younger prosecutors, and will be trying our most serious cases. Welcome back, Alex! Today I am beyond humbled as I reflect upon not only the results of last night's election, but on the months of work and thousands of people my family and I encountered throughout this process. I have many thanks to give, and it begins with God. There is no more awesome, powerful, steadying, loving Being in the world, and without His blessing there is no way that we overcome the 2 strongest political machines in our county, our entire Republican legislative contingent, and other prominent obstacles to our effort. I asked for prayers from most everybody who asked what they could do for me, and it worked. My family, especially my wife Dodie, stood by me when I was most discouraged and anxious, and they courageously and graciously shared those experiences with me. You should be able to count on family, and I am blessed beyond all measure with mine, and this includes lifelong friends who are like family to me. The people who supported, counseled, guided, and helped me are too many to put in a Facebook post, but I love you and and I look forward to thanking you all personally. I want to make a special point to thank our law enforcement community -- I told people, officers included, that you don't win elections without law enforcement, because people trust their opinions about public safety matters. Our law enforcement officers are the backbone of our county, providing the safety and security that many take for granted every day. I ran on a platform of reforming their court-related obligations, and that will be a priority. In that same vein, I want to thank our probation officers, clerks, detention officers, court staff, and everyone who believed in my sincere desire to make our courthouse more efficient. On a more practical note, since I will not take office until 2019, I intend to spend the next few months speaking to our courthouse personnel, attorneys, court-related agencies, and law enforcement officers about everyday improvements that can make us more efficient. With respect to our larger vision, I ask you all to keep with our message through this campaign: Make Alamance safer. To this end, I expect some will use our campaign as a blank canvas upon which to project their expectations; this will inevitably lead to disappointment. The abiding message we kept through our campaign, and which I want to leave everyone with now, is this: I will use my experience and my abilities to best protect this county and its people. I will be guided by the evidence and a sense of justice. Popular opinion, political obligations, and influential donors do not define justice, and thus I am not beholden to any of them. God put me here, you put me here, and to justice I am obligated. God Bless you all,and God Bless Alamance County. Per the Times-News, the publication date has been pulled, so you won't see this in their paper before election day. Courthouse personnel know about the waste; share and help others learn as well. It is a distinct honor and privilege to announce that a retired Deputy Commander of the N.C. State Highway Patrol, Billy Clayton, is supporting my candidacy for District Attorney. Lt. Colonel Clayton was first sworn in as a State Trooper in 1990, and his first duty assignment was Alamance County. 28 years later, he and his family still call our county home. Beginning in 1996, when I first began interning in the Alamance County District Attorney's office, I frequently did ride-alongs with Billy and many local officers in order to learn more about their responsibilities and how I could more effectively prosecute their cases. My work with the Highway Patrol didn't end when I left traffic court for Superior Court. In 2000, Lt. Col. Clayton was the lead investigator in a Second Degree Murder case assigned to me, and he witnessed firsthand my Trial Advocacy skills in a serious jury trial. After rising through the Patrol ranks, Lt. Col. Clayton was appointed Deputy Commander of the Highway Patrol by Governor Pat McCrory (pictured below with Lt. Col. Clayton). He ran all field operations for the Patrol, overseeing 2,400 sworn and civilian personnel, and was responsible for a budget of 220 to 240 million dollars. Having the support of a leader who exercised a statewide level of supervision is gratifying because it reflects his confidence in my ability to lead our D.A. 's office and make Alamance County safe again. Thank you, Lt. Colonel Clayton, for your service to the State of North Carolina and for your support! After 873 days, the District Attorney finally obtained a jury verdict, his second of this 4 year term in office. 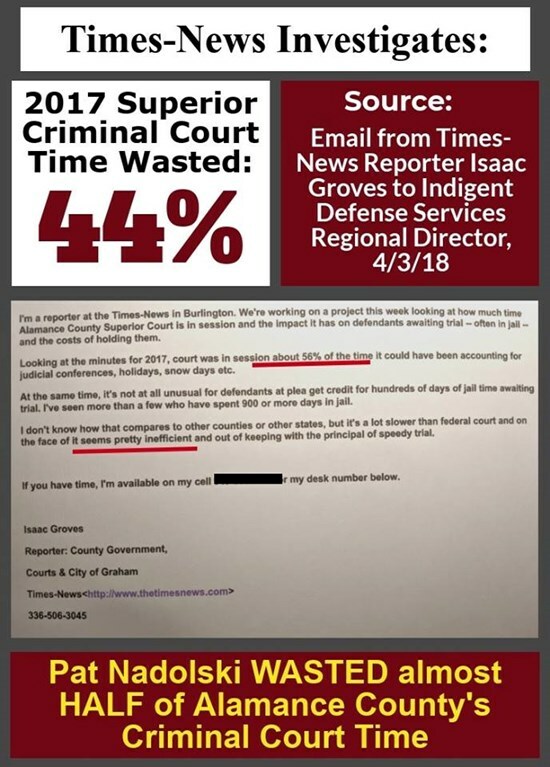 In a case cherry-picked for election year, the Times News stated "With his own lawyer admitting from the beginning that Jerez shot one victim, it was never a matter of whether Jerez was going to prison, but for how long." 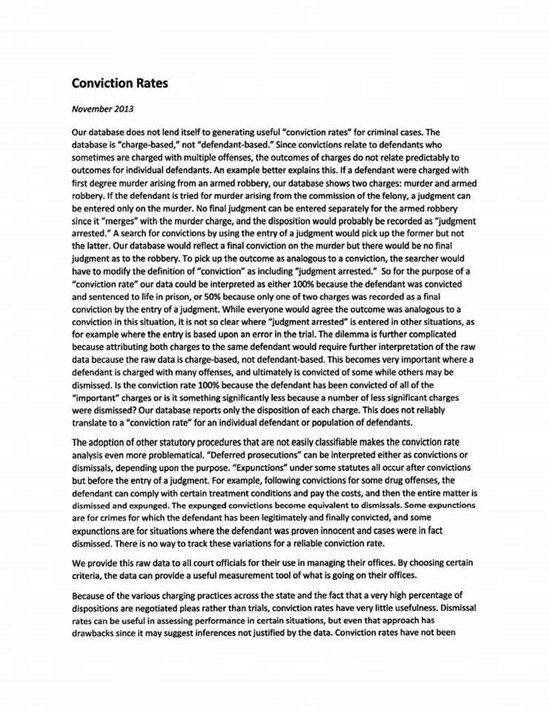 He got 13.5 years total for 3 felony assaults and a possession of firearm by felon; but he was found Not Guilty of the most serious charges, 3 counts of Attempted First Degree Murder, each of which alone carried possible sentences longer than the one he received. Nevertheless, the D.A. was "pleased"...pleased that the defendant received about one-third of what the D.A. wanted. "Pleased" because, he states, "This was a case that had to be tried because of the violence in this case, and there was a defendant who needed to be put away, and the jury’s verdict accomplishes that." 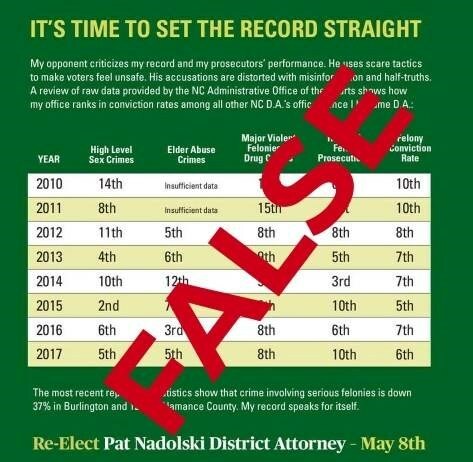 Yet when the time came for the elected District Attorney to deliver the closing argument, to use his position to stand up personally and make the case to the people, he stepped aside and had his Assistant argue. The District Attorney personally signed the indictments for 3 counts of Attempted Murder, but when the time came to step up and make the case to the jury, he folded. Trial prosecutors, especially elected ones, live for the opportunity to speak to their constituents who put them there, and to show the people that their confidence is well-placed. As your D.A., If I put my name to an indictment of this magnitude, you can count on me to literally stand up for you at crunch time. My record backs this up. Current DA has more party switches than murder verdicts. Since being appointed by Governor Perdue in 2009, the D.A. has personally tried only 1 murder case to verdict, the Robert Dixon case, a case in which I led the prosecution. The D.A. 's predecessor, Rob Johnson, served 12 years without switching parties, and secured at least 6 jury verdicts in murder cases. Our safety is not a partisan issue, and it should not be subject to political calculation. I served as a Republican prosecutor for 18 years, and my Republican roots go back to the early-1990's. In this primary, Republicans have a clear choice: a politician who has used Democrats the last two elections and now wants to use Republicans, or a stable Alamance County native who will let his Republican values work for the safety of all of us. On December 8, Alamance County remembered the Honorable J.B. Allen, Jr. in a Dedication Ceremony naming the Alamance County Criminal Courts Building in his honor. 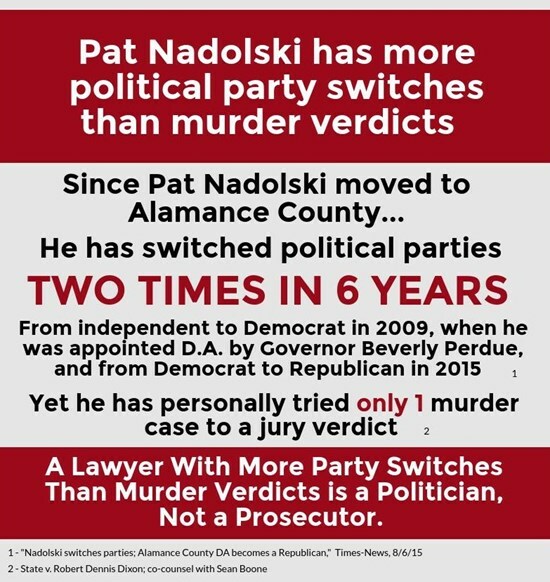 Sean tried his first ever jury trial in front of Judge Allen, and went on to try 22 more cases in front of this respected jurist, more than any current prosecutor in Alamance County. 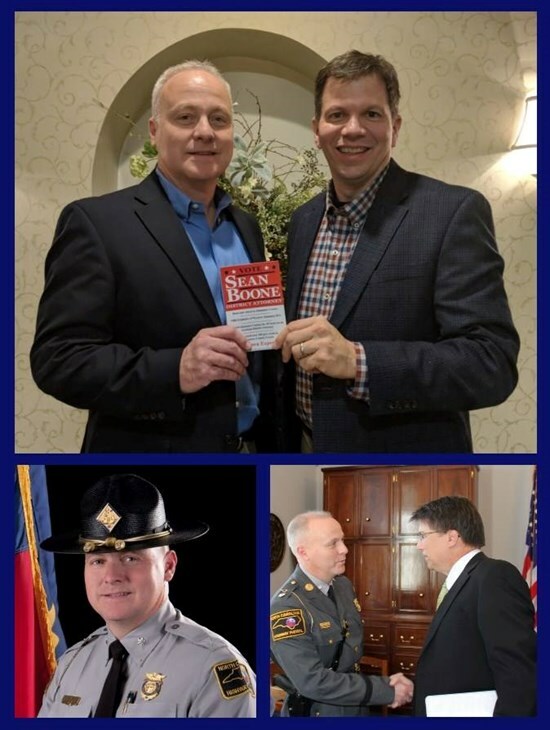 You may be assured that the lessons Sean learned from these trials will be passed on to the next generation of prosecutors to make our county safe again. This Times-News article sums up perfectly why Sean is running: People no longer feel safe in our county, and he has the experience, the track record, and the will to step into our courtroom and restore the public's confidence and the criminals' hesitance. The Alamance News first broke the news about Sean's candidacy today.